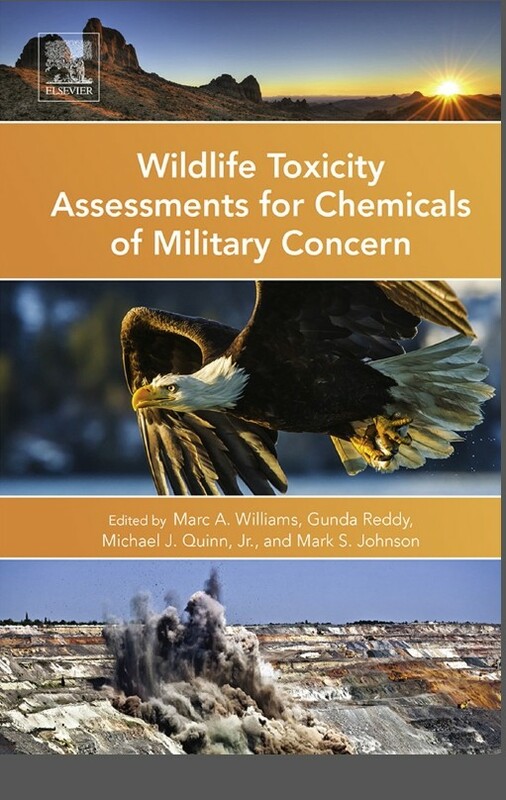 The Toxicology Portfolio of the Army Institute of Public Health (AIPH) recently authored a new book: Wildlife Toxicity Assessments for Chemicals of Military Concern. Back in 2000, individuals from the Health Risk Management Portfolio and the Toxicology Portfolio developed a method to search, document and categorize toxicology information for substances of military concern to assist with making decisions at contaminated military sites. The Army Environmental Command through the Installation Restoration Program supported these efforts. The need was to assist in characterizing the risk for wildlife resources at hazardous waste sites where toxicity values were largely available for humans, but not for wildlife. The Toxicology Portfolio helped to develop these values to enable installations to make sound decisions regarding remediation alternatives. "PHC is not just about human health but the health of the environment around us," said Dr. Mark Johnson, Director of the Toxicology Portfolio and one of the four main editors of the new book. "The One Health approach demands that we approach injury prevention through and understanding of human health and the environment. Diseases come to us from the environment; the environment can be adversely affected through human activity. Everything is interconnected. We need to be good ambassadors of our environment, and the Army takes that responsibility seriously." According to Dr. Johnson, wildlife toxicity assessments and Toxicity Reference Values, or TRV, have been derived for more than 15 years; the first set was published in 1991. Elsevier, a well-known scientific publisher, approached Johnson last year through collaboration meetings and asked if the department would like to publish these assessments. The book idea came to fruition when Dr. Mark Williams, a biologist and immunotoxicologist, joined AIPH in March of 2014 after working at the U.S. Environmental Protection Agency and the National Institutes of Health. Dr. Williams became the primary editor of the book and oversaw its progress in production and publication. The book was co-edited with Drs. Michael Quinn, Gunda Reddy, and Mark Johnson. According to Dr. Williams, the book contains 35 thematically focused chapters and includes a preface that also introduces narrative profiles of each editor and each of the authors. The first two chapters concern best practices and methodological approaches for deriving and evaluating Toxicity Reference Values (TRVs), and discuss different chemicals and compounds that had effects on wildlife and the environment. There were about 30 different contractor and federal government authors involved in the making of the book and Elsevier and Academic Press were involved in the publishing. Dr. Williams said they worked very hard to make this book production possible. "I have worked in the settings of academia, the U.S. EPA, and the National Institutes of Health and have never witnessed the 'can-do' attitude, willingness to collaborate, and interest in other's work by fellow colleagues as I have witnessed here every day in the Army Institute of Public Health," said Dr. Williams. The entire writing and publishing process took approximately one year to complete. Dr. Williams said the initial meeting to begin production on the book occurred in April 2014, following which the first drafts, or "skeleton outlines", were completed in early July. Each author received an electronic package containing the assigned content for a chapter and a style guide written by Dr. Williams called Author Style Guide and Book Chapter Format to promote uniformity. The drafts went through multiple editorial "cleaning-up processes" with the intention that each edited version of the document improved the content and quality of the work. This was made possible by collaborative workflows between the editor, the author, and the publishers, wherein Dr. Williams could follow the revision and production process in real-time through an online manuscript submission and monitoring portal. "The inquiries from the publisher and the authors required daily nursing," Williams said, when talking about the revision and editing process. He monitored the progress of all of the authors' edited drafts using a Microsoft Excel pivot table and spreadsheet. Co-editors Quinn, Reddy and Thompson also contributed invaluable expertise in cross-referencing and fact-checking all of the information and data content to ensure its accuracy and quality, which as one might imagine, was very labor intensive. "We wanted to use the most updated literature we could find to make it the best quality we could,"
The final drafts went through several levels of review in AIPH for evaluation and clearance to ensure that the content was suitable for public release. Before the book was published in final form, there were already 30 pre-orders, which have now presently grown to about 200. "We are hoping that this book will be used by our partners, customers and stakeholders," said Williams, "It will be utilized as a professional risk assessment and decision-making tool and as a resourceful reference document." 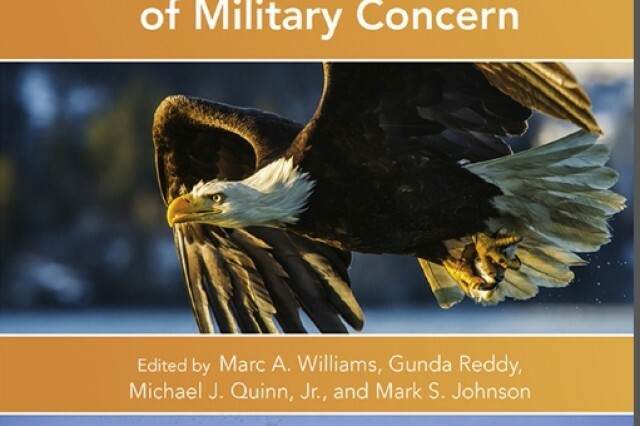 The Toxicology Portfolio believes this book will make a difference by providing an invaluable resource to access risk at cleanup sites and other sites of military concern. Many of the profile use the same data appropriate for human health applications that can benefit the public. Dr. Williams is quietly confident of the likely success of Wildlife Toxicity Assessments for Chemicals of Military Concern. "Being constantly aware of the data and the latest trends in the development of improved approaches and technological tools has enabled us to deliver a product of the highest possible quality that many in the field of ecological and environmental risk assessment will likely adapt as a resource guide for many years to come," said Dr. Williams.